How Long Do Employers Look at My Resume? - Need a New Gig? So you have decided that it’s time to look for a new role and have been dusting off that resume. You put in countless hours of work to make sure that it is perfect. So how much time do employers and recruiters actually take to review that masterpiece? It’s hard to believe, right? Well unfortunately, in our technology driven, fast-paced world it’s true. 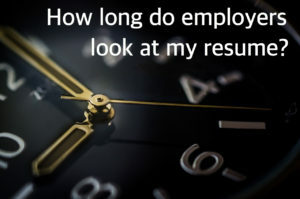 Today, recruiters and employers only spend around six seconds on average looking at your resume or submitted application. It is important to understand why recruiters only spend this much time reviewing your information. In today’s world, it is easy to apply for positions online, and recruiters are going through hundreds of resumes at a time. On average, 75% of candidates are not actually qualified for the position that they are applying for. This means that recruiters need to sift through resumes to find the ones that can be a possible match. Typically, they are working on multiple jobs and have other responsibilities, so they only have a certain amount of time to do this. Recruiters learn to look for certain keys indicators, hence, the six seconds. This means that you have a very small window to catch their attention and get moved to the “in consideration” folder. The key to passing the initial screening is to have a well-outlined resume. Set up your resume so that it is easy to read. Recruiters typically have “hot spots” that they look for, depending on the position. These include location, previous job titles, previous company, education, certifications, certain software packages, etc. You should have your name, location, and contact information at the top of your resume. You will also want to have your previous positions cleanly listed and be sure to include the job title, company, and a description of responsibilities. Keep your descriptions of past employment direct and to the point. Try to focus on using buzzwords, percentages, or positive impacts that you have had on the business. Also, make sure that you list your job history in order. Since you only have six seconds, you want to be sure that your resumes is easy to read and scroll through. Start with your most recent position first, and work backwards. Professionals recommend trying to keep it to 2 pages in length. If you have more experience than what fits on two pages, you can trim it down. Do this by leaving off positions from the start of your career, or only listing the positions that are relevant to the new role you are applying for. Don’t forget to list your education and any certifications that you may have. Depending on your experience, this can go at the beginning or end of your resume. If you are lighter on experience it is a good idea to list this at the top. Include your school, degree or focus, and graduation year. Apply for the right roles – Make sure that you are applying for positions that fit your background and experience. Thoroughly read through the job description and be confident you a fit before hitting the “apply now” button. Tweak your resume – Another good trick to getting past initial screening is to tweak your resume to fit the job description. If a company is looking for certain experience and you have those skills, list them clearly so they are easy to see. Test it yourself – Once your resume is complete, set a timer and open up your document. See what stands out at first glance, and make notes. Remember to try and look for what recruiters are looking for! This entry was posted in Resume and tagged how long should my resume be, Job Search, Recruiter, resume length, resume screening, time on resume. Bookmark the permalink.